How to damp Proofing a basement? 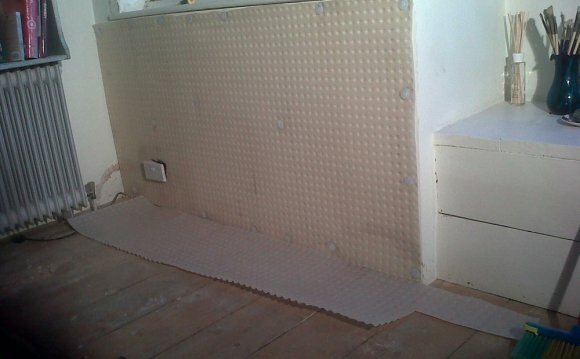 "The most important thing with any basement project, '' says Antony Faretras, "is getting the damp proofing right. If it isn't done properly you've wasted your money – the damp will be back no matter how much you spend." Building and renovation expert Michael Holmes, editor in chief of Real Homes magazine, agrees. "You can either get a specialist basement company to do the whole job from start to finish, or use a builder you trust and get the damp-proofing element done separately. Either way, the proofing must be done by a reputable company with a proven track record." Holmes adds that the builder route is not necessarily any cheaper. So what's the secret to damp proofing that works? "There are basically two methods, " says Holmes, "the traditional chemical one where a waterproof rendering system is used, or the textured membrane solution, which is like lining your basement in giant bubble wrap." And which one would he use for his own home? "I've done two of my own basement projects and used the textured membrane both times. It's watertight but only if applied correctly, even a pinhole could eventually lead to a damp problem. And unless you have ventilation including extractor fans, you'll get the musty smells again." The Faretras used the membrane system, too. "It was fascinating watching it being put in place, " says Antony. "The membrane covers the floors and walls and is sealed with special waterproof tape." Basement conversions are not a cheap option however they're done. The Faretras spent £25, 000 on theirs and they've got a good sized area, about 50sq m covering three rooms (playroom, study, utility room). According to Holmes's estimates (see panel, right), an area that size could cost double that, depending on property type and how straightforward the job. Antony points out that he project-managed the eight-week conversion himself using separate tradespeople, including a waterproofing membrane contractor. Both he and Holmes say the best route for many with neither time nor building knowledge would be a specialist basement company for the whole project. "It's worthwhile in high-value urban areas where you've run out of other options and have already done the loft or can't extend for some reason, " says Holmes. "In terms of increasing the value of your house compared to the project cost, the same rule applies with any home improvement. Research what homes with similar extra space in your area are worth and do the sums." In the current market most people are thinking long-term added value, and for some families simply getting the extra space they need without moving is what matters. When it comes to actually digging out a new basement space rather than converting a cellar, the costs spiral. This only makes sense if the property value is also high, as in central London. Maggie Smith, marketing manager of The London Basement Company, which specialises in digging out new basements or increasing the size and depth of existing ones, reports that although basement conversions became popular in the recent property boom years, work has been steadily coming in throughout the recession. "In the past five years we've had a 70 per cent increase in the number of jobs we've taken on, " she says. "Recently people have been reluctant to sell at lower prices so have put their money in the basement, so to speak. We've done both big central London construction projects and smaller jobs in areas such as Balham, Battersea and Chiswick. "One job in Fulham cost £250, 000, but the house was worth £950, 000 before and £1.4 million after. We find we're doing a lot of mews houses now, where basement space is the only way to increase the living area." Back in Manchester, the Faretras are very happy with their extra storey on all levels. "We've owned the house 10 years and are not thinking of selling so haven't had the house valued, " says Antony. "But I'm confident it's been worthwhile financially long-term because we now have a four-storey house with plenty of family space as well as room to work from home." Neighbours will understandably be nervous if you're digging next to their foundations. The Party Wall Act must be complied with, which means neighbours sharing a wall must be consulted. They can request a written report answering any questions about subsidence or other issues. £850-£1, 150 per square metre with existing cellar. £1, 650-£2, 200 per sq m if existing cellar floor needs lowering (room height should be two metres minimum). £3, 000-£4, 000 per sq m if new basement has to be dug out. Building regulations apply to turn a basement into a habitable space, including ventilation, fire escape routes and ceiling height. Do consider using a specialist company with expertise in basement damp proofing. Don't cut corners. If damp gets in it's very difficult and expensive to correct. Do get as much natural light in as possible by adding windows near ground level, light wells and stairwells.